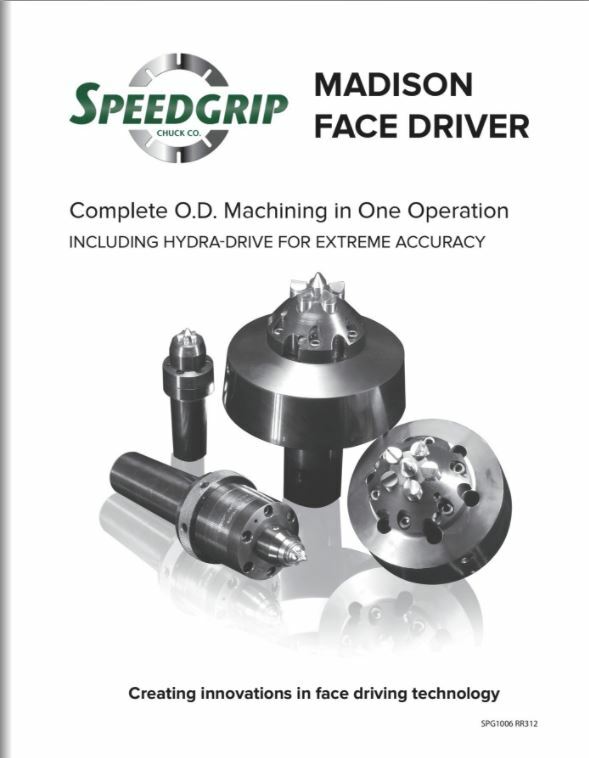 Madison Face Drivers, Pins & Centers - Speedgrip Chuck Co.
Speedgrip acquired the face driver line by Madison over twenty years ago adding it to our already substantial line of workholding. A full line of in-stock Morse taper and flange mount drivers, center points, and pins of various sizes and styles are available for immediate delivery. 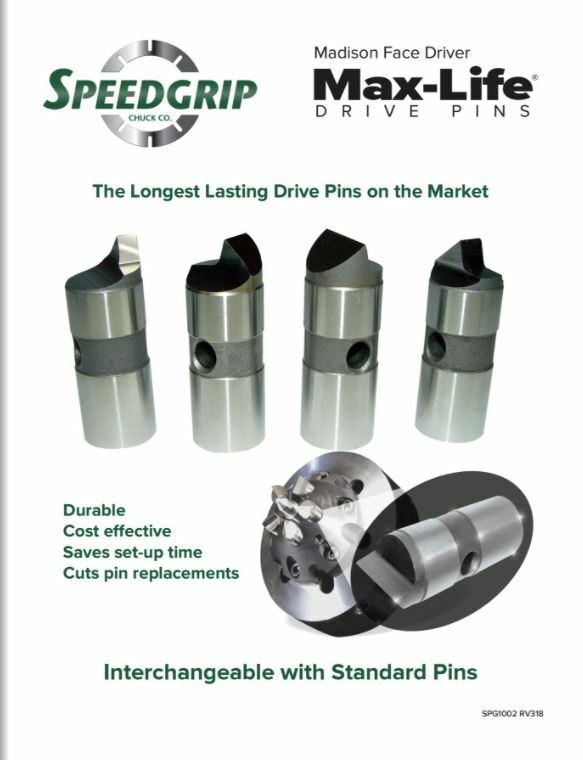 Our Max-Life pins for durability and longevity are available in many styles and sizes. 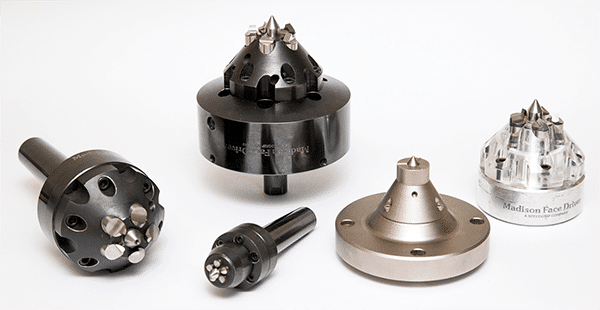 When machining spindles, shafts and or bars, a face driver is an excellent way to hold the part for complete machining of the OD in one operation. 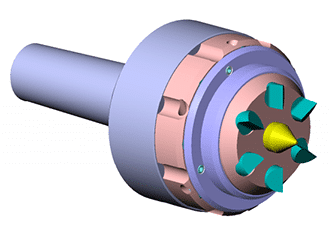 This eliminates the initial turning operation in a 3-jaw chuck typically needed. All turned or ground diameters naturally are more concentric to each other as they are machined in one operation. 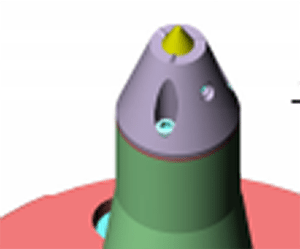 With a center in each end of the part, the face drivers center point enters the part and a series of pins, adjusting for out of square faces, begin to penetrate the part about (.040) one millimeter deep. The tailstock engaged on the opposite end provides the force to seat the pins properly for drive. Adequate tailstock pressure is essential for effective use and performance of the driver. Custom drivers for applications requiring “solid ring” or driving head are for your specific part (s) providing the drive, tool clearance, and features you need. 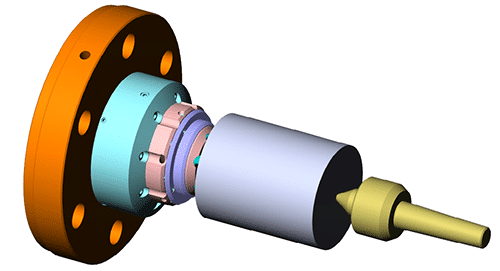 Upon receipt of part and machining information, a quote drawing is submitted as well as a fully design approval drawing for your review and verification to provide the best workholding for your need. Facedrivers are very versatile and can accommodate a variety of diameters, materials, and operations. Used for turning large valve bodies, steel and aluminum billets, small parts such as drills and taps, and forging such as pinion gears. 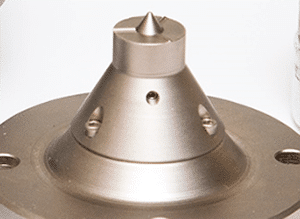 Can be used for rough turning, finishing, hobbing shaping, spline milling, and grinding. Designed with the convenience of a face driver and with the accuracy of a hydraulic arbor. 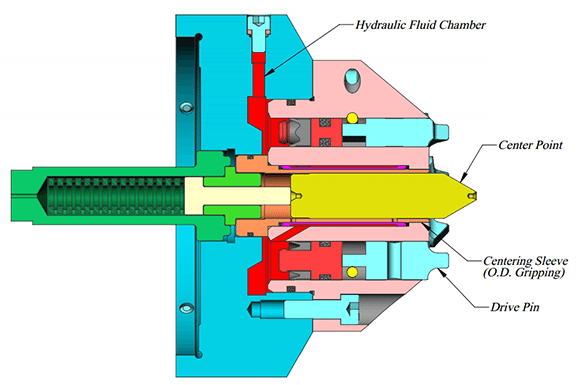 The driver begins to center the part, the pins position to engage the face, and then when the proper tailstock pressure is applied the center point is gripped with a type of hydraulic chuck. This centralizes the center and locks it out for positive later positioning and prides excellent concentricity. 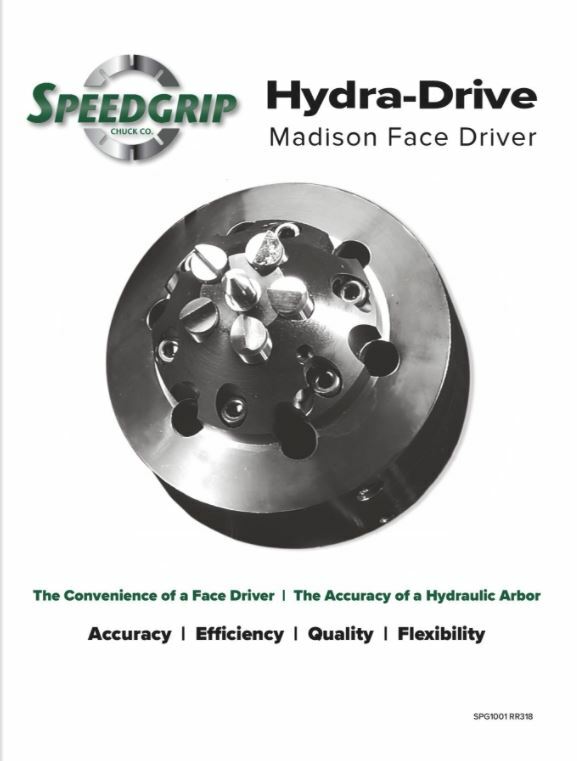 Access the Madison Face Driver full catalog for additional information and specifications. Access the Hydra-Drive brochure below for additional information and specifications. Access the Max-Life brochure below for additional information and specifications.